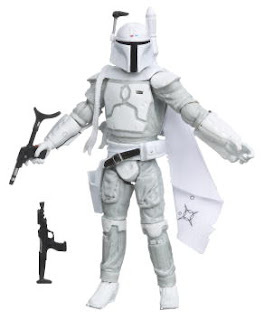 Here's what the latest Star Wars mailaway figure looks like - - Boba Fett in protoype armor. What the?!? I didn't even know there was prototype armor. 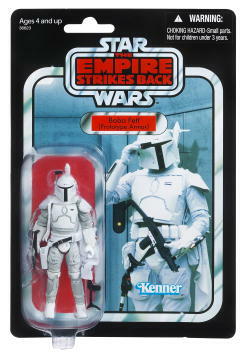 Funny story; months ago, I scoured the aisles of all of the toy stores and Wal-Mart's for weeks looking for the Boba Fett in the TESB retro packaging, finally finding a single one. Two weeks ago, I am picking up my youngest son from school when he runs up to me and says excitedly; "Dad, DAD! Can I ride with Brettan and his mom to the pool party now?!?!" At that moment I experienced a familiar twinge of terrible realization that every parent knows and dreads; I've forgotten about a classmate's birthday. That's right - no plan and no present. And luckily, we live right in the middle of absolutely frickin' nowhere, so a break-neck trip to Wally world is out of the question. Luckily, I offer to fetch the "present" and my son's swimming gear for him and bring it over to the pool directly; therefore buying a bit of time to come up with a fully-wrapped and not-at-all lame birthday gift for a 7-year old boy. So here I am; racing through my office trying to find something that I already own, that's age-appropriate, not worth $100, still in the package and not thirty years old.